Please remember - Safety First! Never make an assumption that a bee swarm is not Africanized! Stay away from them at least 500 yards! Your family and your pets safety are our first concern... Our specialists are professionally trained in the removal of the swarm and any hives found in your home or business. 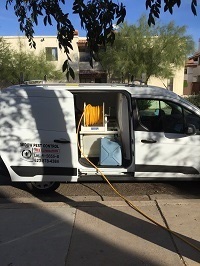 Call us TODAY for a FREE Estimate or any immediate concern you may have. While it is easy to tell a black widow spider from other spiders, people who are bitten by a black widow usually don't look first -- they stick their hands somewhere where it is dark and cool and get a surprise. Be careful not to disturb this venomous spider, contact Widow Pest Control for expert removal and prevention! The most common problem wasp species in Arizona are Paper Wasps, often called Arizona Yellow Jackets. Paper Wasps are societal wasps, which mean they live in large groups, and are a pervasive problem wasp species in Arizona. An established wasp colony or, more commonly, a series of wasp colonies can be very dangerous to humans, domestic pets and livestock. Paper Wasps can sting multiple times and will aggressively defend their nesting areas. Scorpions can enter buildings through openings around plumbing fixtures and loose-fitting doors and windows as well as cracks in foundations and walls. Outdoor lights attract insects and thus the scorpions that feed on insects. Yellow outdoor lighting is less attractive to insects and is recommended in areas where scorpions are prevalent. The first strategy for control is to modify the area surrounding a house, because scorpions are difficult to control with insecticides. Widow Pest Control trains each service technician to customize the service to your home using inspection and scorpion control techniques to target scorpions at their source, where they nest and breed. Of the approximately 50 cockroach species that occur in the U.S., the German and American cockroaches are two of the most common species that infest homes, restaurants, hotels and other establishments. Cockroaches are one of the most despised and dirty insect pests, contact us for proper treatment and preventative solutions TODAY! Crickets belong to the order Orthoptera along with grasshoppers and katydids and belong to their own family, Gryllidae. While most orthopterans are plant eaters, these crickets are omnivores (as you will not doubt figure out observationally!). Crickets are known for their song, produced exclusively by the male using a file and scraper structure on his forewings. You can recognize the adult male by this structure which appears as crinkles in his wings. Males sing to attract females and to defend territory. Interestingly, crickets have ears in their legs. Adult females have a distinct dark ovipositor that they stick into damp sand when they are ready to lay eggs. Juveniles are smaller and have short wing buds rather than complete wings. It is important to understand a little about ant biology in order to control ants successfully. Ants are social insects, which means they live in groups of numerous individuals called colonies. One individual, called queen, produces all the eggs. She stays deep within the nest where she is protected. The ants you usually see are the workers. Their main job is to gather food and take care of young ants. When you smash a few of the worker ants, you may actually be doing very little to control the colony as a whole. It is likely there is a fresh supply back in the nest, and the queen will produce more. 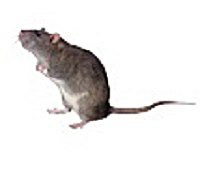 Rats are excellent climbers and they usually live in spaces on the tops of buildings, on roofs or in attics, basements and ground floors. They also live in sheds, garages, boxes, ceilings, under flooring, in wood heaps and in thick grass. Mice mainly live in structures. However, they can live outdoors as well. They breed throughout the year and share their nests with their relatives. Ticks are often found near wooded and highly vegetated areas. Some species require moisture to survive. All females and males of most species feed on blood of mammals, birds and reptiles.